As a busy mom, I try really hard to maximize our income the best we can. One of the most varying areas in our budget has always been groceries. So I’m often searching for smart ways to keep it as low as possible, without living on ramen noodles and pb&j sandwiches. Here’s 15+ of the BEST Grocery Budgeting Tips EVER that I’ve found, tried and loved! Now, maybe some of these won’t work for you. Don’t overwhelm yourself and try to do all of them at once. Pick a couple that would be best for your situation, then maybe down the road implement a few more! Make a list, and STICK TO IT. Be strict with yourself on this, or at least plan ahead for which situations you are allowed to budge on (for example, if you see an item and you FOR SURE need that for a recipe this week, and you KNOW you don’t have any). I’ll admit, I struggle with this – thus bringing us to my saving tip number two…. Only carry cash with you. Check sales/prices, check your list, and bring enough cash (don’t forget tax). I know that if I carry cash, I’m less likely to purchase things I don’t need because I would be horrified if I got to the register and didn’t have enough. Make sacrifices, or substitutions. For example, leave the cheese off your meat sandwich and use lettuce instead. Or splurge one day a week on a ‘gourmet’ sandwich with cheese, but in exchange take pb & j another day even if it isn’t your favorite. A name isn’t everything = be willing to try non-name brand items. Most of the time, I get generic-brand items for a lot less than popular brands, and really don’t notice a difference (other than the savings). Try to make fewer shopping trips. I know myself well enough to know that the more trips I make the the store, the more ‘extra’ stuff I buy. Now, I cannot bring myself to shop for the whole month in one day – although that is a goal of mine to work towards. However, Danielle @ Blissful and Domestic is amazing at this, so be sure to go check her out to see how she does a whole month at once. For now, I just do one trip per week (as best as I can) – so try what you can. Coupons – please know that I am Not. A. Coupon. Person. Seriously, I hate dealing with coupons, unless some kind person at the store says ‘oh, here’s a coupon for that item in your cart’ – imagine how often that happens, though. If you are then you’re my hero, and I tip my hat (not that I ever wear hats, but if I did) to you! I will note, though, that Ruth @ Living Well Spending Less says coupons aren’t where the savings are – it’s in the store sales. Go read her article for more on that – it’s GREAT! The biggest saving tip FOR ME – cooking from scratch as much as possible. Now, I LOVE pre-made dinners and such that make life all the less stressful and more convenient, but it does come with a higher price tag. If you can bring yourself to do a little more from scratch, it can really add up with savings. Learn which stores have the best prices for common foods. Checking the ads is a fantastic way to take care of this, especially since items can change each week. Sometimes, however, there are stores that just always (or mostly) have certain items cheaper. For me, I always buy milk at my local Aldi store because I’ve never gotten it more than $1.99 each. Compared to the other MAIN store I shop at, there’s is rarely down that low. Use what you have on-hand. Yes, I know stocking up is a great thing, but also be sure you’re utilizing things instead of letting them go bad. A good idea is seeing what you have then planning meals AROUND what is already on your shelf. Avoid the ‘snack packs’ and other sugary convenient kiddie snacks. I do get these sometimes, but am trying to do better. Getting on-sale produce, crackers, yogurt, etc. 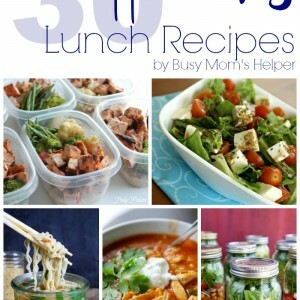 will not only help your budget, but also help your family be more healthy. Check your local bakeries later in the evening to see if they have any mark-downs for the day they’re trying to sell. Drink water. This is really REALLY hard for me! I love my Dr. Pepper, and juice. However, I AM trying to reduce my intake to only one Dr. Pepper per day, and doing mostly water the remainder. Still struggling, but progressing! Purchase produce when it’s in season (thus, on sale!) and FREEZE it for later. This way, you can stock up while it’s more cost-friendly, but enjoy those fruits and veggies year round. Eat at home more often. I love eating out, but my family has done really well as of late to eat at home a LOT more often, making eating out a special occasion or treat. Even then, we watch for Kids Eat Free specials, birthday deals, ‘happy hour’ dinner specials, etc. Eat less meat. Meat can be really expensive, so having it less often can really help the budget. Or just exchange your normally expensive cuts for a downgrade type cut – for example, instead of boneless chicken breasts do drumsticks and thighs. Or a cheaper cut of steak instead of a Ribeye. Go to the store WITHOUT YOUR KIDS. I have a hard time with this, since I have four little ones, but I do still try to get the shopping done when daddy is home to watch them (plus it’s a nice break for me from the mini van!). With kids, you’ll get more ‘can I get these’, whining, and be a lot more distracted. Go shopping AFTER you’ve eaten. When you’re hungry, you’re more likely to buy more items and buy things you normally wouldn’t care about. Going on a full stomach can even help you realize that certain things just aren’t necessary. Find a produce co-op, such as Bountiful Baskets. I started using this when we moved to our new house (had just learned of it from my Uncle), and it’s been a HUGE help with our grocery budget. You can get produce for a lot cheaper, stock up on in-season-so-low-priced items, PLUS it helps (at least it has us) your family eat more produce, which is great for your health. 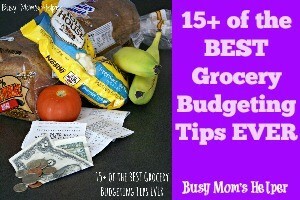 What are YOUR Best Grocery Budgeting Tips? Breakfast is the most important meal of the day, especially if you’re going to be walking around a theme park for hours. You’ll need a lot of energy to get you through all those steps and the crowds, so make a smart decision and start the day off right at one of these 5 Great Places to Eat Breakfast at Disneyland! While there’s breakfast options at Disneyland that can be as magical as any ride, there are also options for those in a hurry to get going. Whether you’re a regular breakfast eater or not, here are some of the best suggestions of what to eat when you start your day at the happiest place on earth. At Carnation Cafe on Main Street USA, you can take in the timeless scenery while you enjoy a classic American breakfast at Disneyland. Country Fried Steak and Eggs, Pancakes, or Mickey Waffles are also on the menu. Kick back and gear up for a full day of fun by stopping here before you begin your adventure. It’s also a great location to sit outside in the shade and watch all the excited, eager faces as they make their way into the park! This Mary Poppins inspired bakery is a lovely place to enjoy a fast breakfast pastry and some coffee. It has such darling charm to it! There’s a patio that overlooks the hub for you to relax at (as long as you aren’t too anxious to get going) – but you can also walk with your food if you need to make time while enjoying breakfast at Disneyland. If one thing will keep the kids entertained while you get fueled up for a long day of excitement, it’s character dining. The Plaza Inn offers pastries, cereals, eggs, breakfast meats, french toast, Mickey waffles, biscuits and gravy, as well as made to order omelets. They’ve got the bases covered, and classic Disney characters come around to the tables. Plaza Inn is also on the hub at the end of Main Street on the right side, near the entrance to Tomorrowland. If you decide to get a little bit of a head start on the rides, one of the best plans is to do a few attractions in Fantasyland and then take a break at Red Rose Taverne. Afterwards, you can explore more of Fantasyland, or continue west toward Frontierland. The Red Rose Taverne is inspired by Belle’s provincial town in Beauty and the Beast! There’s a warm and cozy indoor atmosphere as well as plenty of outdoor seating with a view of Casey Junior. The food is quick service, but this is one place where you can get seasonal treats mixed in with the regular menu – as well as Mickey Mouse pancakes. A more formal dining experience awaits at the River Belle Terrace on the outskirts of Adventureland. This restaurant exists at the three point intersection of Frontierland, Adventureland and New Orleans Square. Among the unique breakfast offerings here are the Mark Twain (eggs, breakfast meat, potatoes, biscuits), short rib skillet, and again Mickey Mouse Pancakes. Never take a Mickey waffle when you can have a Mickey Mouse pancake – not everybody does it! River Belle Terrace is in such a great location for a late-morning breakfast after experiencing either Frontierland or Adventureland. Plus, it’s right in front of the entrance to Pirates of the Caribbean. Don’t forget to make a reservation for this one! Where’s your favorite place for breakfast at Disneyland? With Valentine’s Day so recently, I loved seeing all of the local shelters and rescues posting their holiday specials so you could adopt your new furry Valentine. Sweet dogs and cats holding little signs such as ‘Be My Valentine’ or snuggling heart-shaped pillows? Melt my heart! For those of you still stuck at the thinking stage – whether or not you should adopt a new furry friend – here’s some of my thoughts about how to tackle at least some of the things that may be causing hesitation. Because really, adopting comes with Love and Pet Messes – but we can help with that last one! We’re long past the thinking stage, but I still remember that amongst the excitement and desire to get a pet, there were concerns. Will we have enough time to pay adequate attention to our new pet? What are the costs involved? Are we going to be able to keep and care for her long-term? And of course – what about the PET MESSES?! I know animals shed, and it can be super frustrating – but the great news is that it doesn’t actually have to be a hassle! If the messes are the last thing keeping you from enjoying the amazing friendship and love of a new pet, you can rest assured that Swiffer + Febreze can save the day with a swish and a spray. You can nab both during your next trip to Kroger! 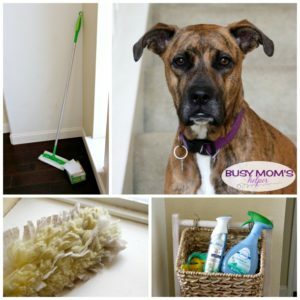 I was thrilled to learn that my favorite cleaning helper – Swiffer – now has special pet-specific products to really give us pet-owners some help. I’m talking about the awesome Swiffer Dusters Heavy Duty Pet Refills, as well as the Sweeper Dry and Wet Pet Refills with Febreze Odor Defense that Trap+Lock all that pet hair and dirt. I’ve always loved how easily I can sweep up all the dead grass and yuck on my floors, then making them fully clean and shiny. Plus the Swiffer Dusters are AMAZING for getting all the nooks and crannies around the house where my dogs’ shedding seems to come to rest. Along with the ‘pet messes’ is the smell – we all know that dogs and cats don’t always smell like roses (despite rolling around in them often, it seems!). But that ones even easier, because Febreze AIR Heavy Duty Pet Odor Eliminator can freshen up all around your home with a quick spray. If you’re worried about your couches – my pups LOVE laying around on our couches – then never fear, because there’s also Febreze Fabric Pet Odor Eliminator that helps to quickly freshen those up, which is particularly great before having guests over. While there may be other reasons you’re not ready to commit to a pet, if you’re at the point where you ARE ready, it’s truly an incredible bond between pet and owner. We love our pups so much – they truly complete our family! There’s ups and downs in all love stories, but Swiffer + Febreze can help make sure you don’t sweat your pet because of the mess or odor. No matter what stage you’re at – thinking, plunging, or loving (that’s us!) – you can enjoy the fact that Swiffer + Febreze help clean and freshen up pet messes quickly AND efficiently. That means you can spend more time with your new fur-ever friend! What pet would YOU most enjoy? Ah, frosting….how I love thee!!! Seriously, frosting is just Da Bomb! So for my twins’ birthday Saturday, we made some cupcakes for them to take to preschool (although we’ve now had snow days since, so still haven’t taken them – I may have to eat these ones and make more) for their special treat. I wanted to try a different frosting, something unique from the common whipped or butter cream (I do love these, too, just do them all the time). 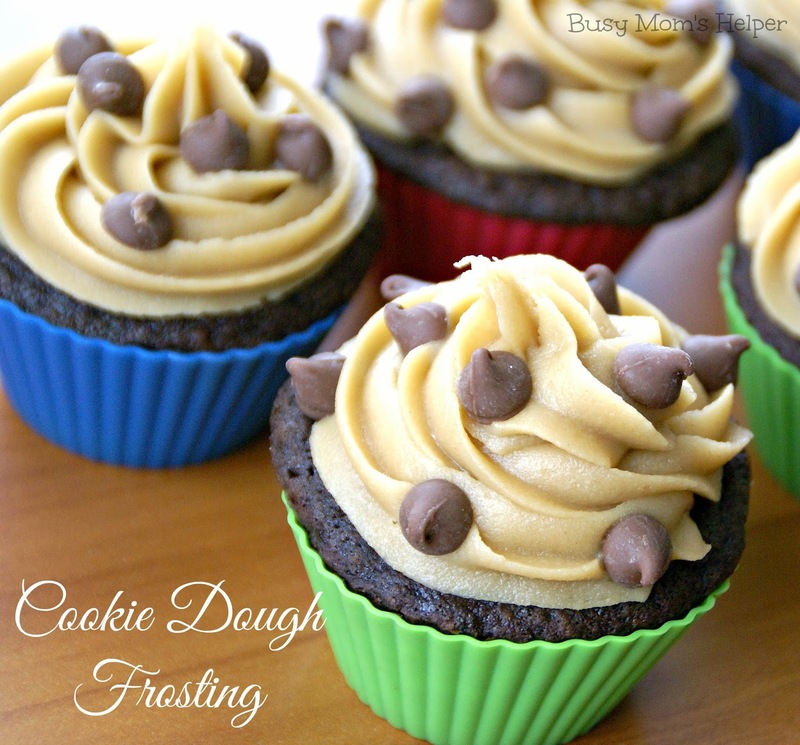 Then, as I was baking the cupcakes, I started craving cookie dough. 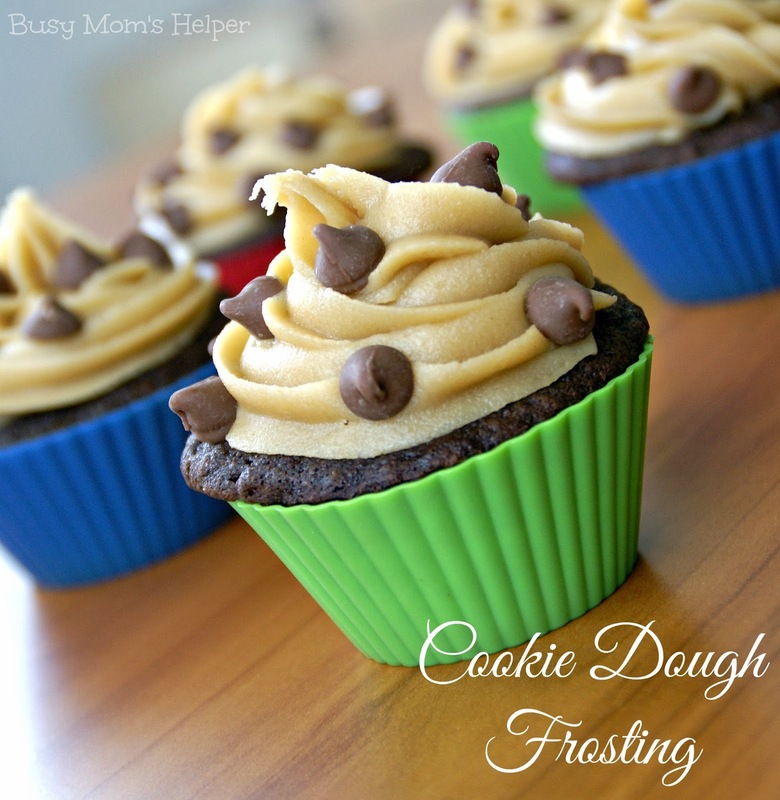 Wait – let’s try some Cookie Dough FROSTING! Oh yeah, I totally went there! This turned out delicious – perfectly pipe-able, creamy, and tasting JUST LIKE COOKIE DOUGH (no eggs, no worries)! This recipe did about 18 cupcakes, piped as shown above. With a fork (or beaters) SMOOSH (aka Cream) together the Butter, Brown Sugar and Vanilla. Add the Flour and Salt and mix until well combined. Carefully add the Milk just 1 tbsp. at a time – until you reach your desired consistency. I used exactly 9 Tbsp, but you may prefer more or less. 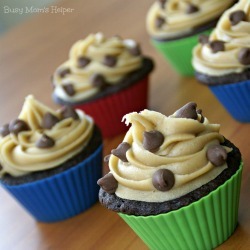 Pipe onto your cupcakes (or cake, or whatever you’re frosting), then top with Chocolate Chips as desired. While many don’t really give it much thought, you actually CAN eat healthy at Disney World – sometimes you just need to implement a few tricks like ordering an entree without the sides, or snacking on various salads. There are all kinds of variations of salads alone that I could do a list on. While I totally recommend enjoying a variety of foods as you make your way through the parks, it’s good to look for healthy snack options occasionally, too. You can easily find them at the fruit stands and counter service locations. Here are five Healthy Disney World snacks for under $7.00. This is the priciest snack on the list, but you’ll understand why. This cute Little Mermaid inspired dish has a gorgeous presentation and it’s perfect for shrimp lovers (like my hubby). It’s found at Prince Eric’s Village Market, where you can find other healthy snack items as well. Sunshine Seasons in Epcot is one of the best counter service locations you can go to for healthy snacks, as well as variety! They have tons of grab and go options, and most of them are pretty good for you. If you prefer to get something hot, try the Chicken Corn Chowder. It’s under $5 and is fantastic. There’s also a black bean soup you can try if you don’t eat meat. One of the most prevalent and easy to find healthy snacks in Disney World is this little pack of veggies and hummus. You can find them in fruit stands all over the parks and resorts, including Sunshine Seasons. These cost only $4.49 and are among the healthiest treats you can eat while on vacation at Disney World. They’re also a big hit with kiddos who just need something to munch on! Sunshine Seasons is so full of healthy choices, I couldn’t help but include one more option. While the Carrot and Celery pack is available all over Disney World, I’ve only seen these chips at Sunshine seasons. This is a great substitute snack option if you are a really heavy chip eater. Fruits and veggies are great if you typically like to eat fruits and veggies, but if you want something that feels a little more indulgent while on vacation, these veggie chips are kind of like the best of both worlds. Last, but not least, we come to fruit. It’s the lowest cost healthy snack option and you can find it almost anywhere these days. You can find easily accessible fruit stands with grapes, apples, clementines, pineapple… fruit is a healthy and sweet treat that is very convenient when you’re eating healthy on-the-go in the parks. 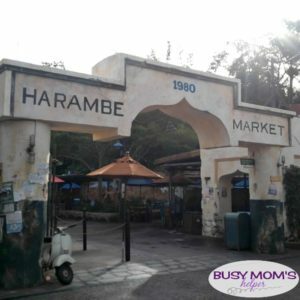 Some fruit markets are less beneficial than others, though – Anaheim Produce at Hollywood Studios only offers beverages and pretzels on the menu, but Harambe Fruit Market is a true fruit stand with a variety of options in whole fruit and fruit servings. This fruit stand is located in the African section of Animal Kingdom Park. There are fruit stands in Magic Kingdom at Liberty Square, Epcot at (you guessed it) The Land Pavilion, and of course in the resorts as well. What’s your favorite healthy Disney World snack? I’m all for encouraging reading in my kiddos, so fun bookmarks can be a huge help. 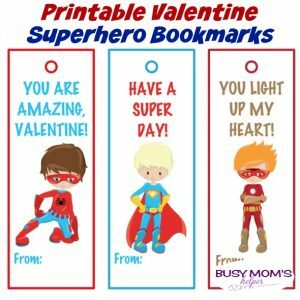 With the upcoming holiday where they’ll exchange tons of Valentine’s with their classes and friends, these Printable Valentine Superhero Bookmarks are just the ticket for the little (or big) hero in your family! My boys can’t wait to give these out for Valentine’s Day at their schools! We’re printing a bunch, then tying ribbon in the hole at top (just use a hole punch, super easy) – then they’re all set to go! And can I just say I’m THRILLED that my kids are old enough to sign their own names on their Valentines – I can’t imagine having to ‘help’ with the name on every single superhero bookmark for their whole class! 7 Things to NEVER Bring on a Cruise Ship, plus 10 You MUST! During all the excitement leading of to you cruise vacation, it may be hard to focus on packing. I’m a bit of an obsessive packing-list-maker, but even I was struggling with what I’d need for our Carnival Cruise last month! I decided to ask the staff onboard what they thought were the have to or definitely don’t brings, from their own experiences working there. We heard some entertaining stories, that’s for sure, and they all helped us compile a list of 10 Things to NEVER Bring on a Cruise Ship, plus 7 You MUST! Some of these may seem like no-brainers, but if it’s on the list it means somebody at some point has tried it! Contains affiliate links that give us a small commission at no extra cost to you. See our disclosure for more info. Now, this is definitely not an all-inclusive packing list – do NOT only take what we tell you are ‘have to bring’ items. I’m not putting clothes on here because, really, if you can’t remember clothing then perhaps you’re already too drunk to go on a cruise. This are just some things that many people may not think to take – or may consider taking that really aren’t allowed, or even safe! Guys, there are plenty of towels on the ship – and you can even take it with you to port (just be sure to bring it back! ), so there’s no need taking up precious suitcase space with bulky towels. They do allow a limited amount of canned drinks – like soda – per person brought on board. Bottled drinks (like the 16/20 oz. bottles), bottled waters and any alcohol are not allowed and will be either discarded or confiscated, to be returned to you at the end of the cruise. See your cruise line for their specific rules on this. One crew member told of a couple that brought FIVE huge suitcases for the two of them on just a week-long cruise. They wanted multiple outfits each day, several swimsuits, lots of shoes and everything. Every time he saw them – even on the same day – they were wearing something different. The problem was there was no free space in their room and they kept complaining about it – but it was simply because their luggage took it all up! So I guess this one is more of a ‘highly recommend not doing’, but it’s your call. Fire is one of the most dangerous things that can occur on a cruise ship, so they are VERY strict on any fire hazards. Don’t bring anything like candles, cooktops (yes, people have tried this), or especially fireworks. Instead of candles, if you’re looking for a special scent to your room, just get one of those plug-in scents. This will ruin not only YOUR entire trip, but risks affecting others on the ship as well – both guests and crew. The people on cruise ships are amazing, and if you have a good attitude, it’s nearly impossible to have a crappy vacation. And you never know what a good attitude may get you! Yes, you may need a few for before getting on the ship, but that’s about it. There’s SO MANY places to eat at any point in the day, and room service is just a call away. From the main dining rooms, to the buffet, to other spots like a pizza or burger spot, specialty restaurants and more – you will not have a shortage of food or snacks! I can see the temptation, as this would be really fun – but it also causes risks so drones aren’t allowed on cruise ships. Not only can it be seen as a risk of spying into other people’s rooms, but it’s a distraction and could affect the navigation of the cruise ship. Drones are just another thing you should never bring on a cruise, or you may loose it! Now that we’ve got those out of the way, check out this ten things that are SUPER great to bring on a cruise, that you may not have thought of to include in your packing list! We make sure to bring all of them for every cruise, since they make a huge difference for the trip. There’s not many plugs in a cruise cabin, and since most people have multiple things needing to be plugged in (phones, tablets, etc. ), it’s a good idea to have a strip with more outlets so you can utilize it better. NOTE: I’ve heard from some that while power strips are fine, be sure it’s not a surge protector type because some ships/cruise lines may not allow those. These come in handy for so many things – taking along random little things (hair elastics, seashells, etc. ), packing some snacks for a shore excursion or to take back to your room, bigger ones can hold wet clothing instead of dripping it all down the hall, and to store liquids that may leak into your suitcase. While most people think these are only good for shoes (they’re great for shoes, but that’s not all), this is handy so you can put your ‘need to grab easily’ items like sunscreen, chargers, notebooks, maps, etc. You can also organize it so the next day’s outfit/shoes are there ready to grab first thing! I first used mine in Hawaii, and now LOVE taking it on vacations with me! It was great for our excursion to Atlantis, and since many people tend to spend a lot of time at the pools on the ship, this allows you to keep your phone (and room key/cards) handy, but still safe from the water. 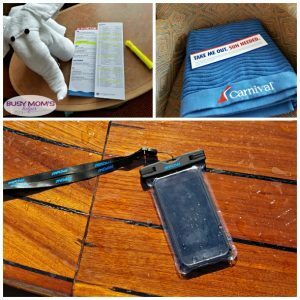 It can get really windy up on the decks at sea, and you don’t want your towel or swim cover-up to blow off your chair, so bringing clips to fasten them as you lounge or swim is a great idea. Each day you’ll get the pamphlets with all the happenings and schedules for the ship, and since there’s SO MUCH to choose from, having a highlighter so you can mark things makes it much easier. You can even do different colors – like pink for ‘have to do’, yellow for ‘maybe’ or green for ‘the kids and blue for ‘the adults’. Crew members said how often people, particularly women, bring just fancy or nice shoes with heels, then hate how bad their feet are hurting or have a hard time walking on a moving ship. It’s a good idea to bring a pair of flats, just in case. There are no clocks in the cruise cabins, so if you’re like me and practically HAVE to be able to see what time it is during the night (or day), bring your own. I recommend a small, cheap one that’s easy to pack/transport. Our previous cruises had shampoo and body wash in the showers, but no conditioner or body lotion. If you may need those, bring your own just in case there isn’t some supplies. Also bring your own shampoo and other personal products if you’re very picky as to the brand. In the theater, and up on deck, it can get a bit chilly at times, so it’s a good idea to have something you can wrap around yourself. I love taking one of my soft, fluffy blankets with me – especially if we plan to watch one of the movies on the big screen by the pool! What would YOU add to this list for a cruise vacation? Check out our other posts from our Carnival Cruise fun! 5 Common Cruising Myths Debunked! It’s crazy the differences between when we were growing up, and now our kids – especially with technology and constant, instant access to the online world. While in San Antonio on Monday celebrating Safer Internet Day, I learned several ideas and tips from our Be Internet Awesome adventure that will help parents and families learn more about Internet Safety. After all, despite all the good the internet gives us, there’s plenty of bad to keep an eye out for! It was really creative the way they set up their Be Internet Awesome event, making it interactive and playful (while still educating – woot woot!) so that the kids were really pulled into the topics. To make it simple and cover the most important aspects of internet safety, there’s the ‘5 Zones of Internet Safety & Digital Citizenship’. We all know those pesky phishing scam emails that seem to be constantly hitting our inboxes – but do your kids? Especially with email addresses being useful – or even necessary – at younger ages in school now, we need to make sure our kids are aware and being ‘alert’ to these possible scams. The kids got several cards that had an ’email’ written on them, they then put the card in either the REAL slot or the FAKE slot. The machine then told them if they were correct, and if so then why it seemed more real or what made it suspected as fake. At the end, they got to shoot the ‘fake’ email! While this covered a couple different topics, overall it was about what type of documents/information are ‘smart’ to send online. Kids were given different types of things (photo of baby cousin, school paperwork, etc.) and then had to decide if it’s something to share wherever online, just with close family and friends, or to not share online at all. I absolutely LOVE that they included this zone of internet safety, because there’s seems to be so much hate and mean words online. It’s bad enough kids get bullied at school so much, there’s a further reach online waiting to attach them, too. This station let the kids send ‘hearts’ to help fellow kids who were being ‘attacked’ by mean things (little pink spiky balls), as well as ‘block’ and even tell a grown up – such as a teacher or parent – if things didn’t get better quick enough. How strong are the passwords for YOUR accounts? The statistics we learned about passwords was pretty shocking, and made me grateful that I’ve always been a little paranoid so set really unique and wacky passwords. This showed kids WHY it’s important to have a secure password (that you shouldn’t share with others, other than parents). No matter if you’re middle aged or a tween, you should have a STRONG and UNIQUE password, not just name or nickname (which about 24% of 16-24 year olds use – yikes!). They should be at least 8 characters long, and use a mixture of letters and numbers. This one’s super important to discuss with our children, because it talks about being brave enough to come to an adult – either with a question, concern or for help. Not only adults, but for other kids who are aware of something negative to be brave to go to a grown up, even ‘anonymously’ that can then help whoever is having the problem. The most important thing about internet safety is TALKING with your kids about all of these topics, and helping them feel comfortable in case they do ever need to come to you with a concern. I’m so grateful Google held this event – join us in celebrating Safer Internet Day with this awesome NEW Family Guide full of tips and learning so we can all work Together for a Better Internet! Kids will be able to put their new skills to the test with Interland, and your family can enjoy a much safer, better online experience. Another great suggestion is to help your child’s school get involved by sharing Be Internet Awesome with their teachers, principals and leaders. The more people who learn this helpful information and help guide our children safely online, the better it will be for all of our families. What’s your biggest internet safety tip? If you’ve been to Disney World, or at least looked into a trip there, you’ve likely heard of the Disney Vacation Club (DVC). Maybe you wondered what it was, or if it was something that could be beneficial for your family. I was curious myself, because while I have rented DVC points before on my first Walt Disney World trip, I didn’t know much else about this whole thing. Luckily, today I’m sharing Everything You Need to Know about Disney Vacation Club! Disney Vacation Club is a timeshare service that allows members long-term investment in Disney property. When you buy into DVC you choose a home resort in which you will own a real estate interest. What you are buying is points that can be used at DVC resorts across the board at fluctuating values. The point value of a span of time in a DVC resort depends on the value of the resort and time of year. You also pay a small annual maintenance fee on the points you own. DVC only buys you the accommodations for your Disney Vacation. That’s usually the largest chunk of the vacation cost, especially considering where you get to stay. However, there is more to consider in the cost of your vacation than just where you stay. The admission into the parks for one is a sizable amount, so for families it can really add up. While DVC members don’t get discounts on park tickets, they do get discounts on annual passes. As a DVC member you also qualify for a Tables in Wonderland card, which grants discounts at most restaurants in Walt Disney World. Besides the discounts that become available, you also have access to exclusive lounges and events such as members only workshops, seminars, and fishing tournaments. Members also have access to more events that are not available to the general public. Depending on how often you travel to Disney World, DVC may (or may not) be a worthwhile decision. You’ll gain access to premium accommodations and other perks, but it shouldn’t be viewed as a money saver or an investment, unless you have a proven record of frequently indulging in Disney vacations and are ready for more of a commitment. That said, there is surprising flexibility with how you can use your points. You can bank them for the following year, borrow them from the following year, and even sell them to another party. You can buy DVC directly through Disney, or you can buy somebody else’s contract for less. The cost per point is $182. You can purchase a minimum of 100 points which comes to $18,200 plus closing costs and a monthly maintenance fee. Financing is available with a 10% down payment ($1,820) for a monthly payment of around $217. The number of nights that your points are good for vary by accommodations. You could redeem the same points for a week in a deluxe studio, or a couple of nights in a 2 bedroom villa. There are 15 total DVC resorts, 11 of which are located at Walt Disney World. Animal Kingdom Lodge and Wilderness Lodge each have two. 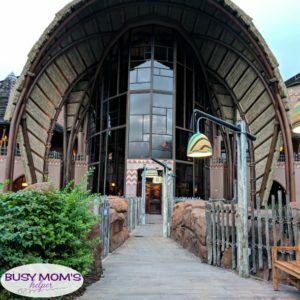 Jambo House at Animal Kingdom Lodge has a starting price of 9 points per night. Old Key West starts at 10 points. 11 points will get you a night at Saratoga Springs or Kidani Village at Animal Kingdom Lodge. These are Animal Kingdom and Disney Springs areas, so they are valued lower because of location. However Boardwalk Inn is also a 10, which is a steal. From there it is a leap to a minimum 14 points per night at Bay Lake Tower, and 15 for Wilderness Lodge and Beach Club. One of the top resorts in Disney World, the Polynesian Village Resort, starts at 16 points per night. The Grand Floridian Resort and Spa, having the most luxurious accommodations according to many, has a starting price of 17 points per night. The Grand Californian Resort and Spa at the Disneyland Resort on the west coast is also 17 points to start. Other DVC resorts outside of Disney World are Aulani in Hawaii, with rooms from 16 points per night, Hilton Head Island Resort from 6 points per night, and Vero Beach at 10 points. Have you considered the DVC? Today I’m sharing you one of our absolute FAVORITE cookie recipes, and it isn’t even my own! My Dad, who loves to experiment with recipes to make them more healthy, came up with this one and was kind enough to share it (and gave me permission to pass it on to y’all)! For a bit more fun, we’re even comparing it so you can see the nutritional difference between Nestle Tollhouse VS. Dad’s Recipe: The Healthier Cookie! I know that the Nestle Tollhouse Chocolate Chip recipe is many people’s ‘go-to’ for cookies, but now you’ll think twice once you not only see the healthy difference, but also TASTE the amazing deliciousness of my Dad’s Cookies! This is comparing based on Cookie-to-Cookie of the same size, 1 tbsp scoop of dough size to be exact. It took a bit for me to go through everything, then divide appropriately, to find the correct nutritional values….but this is as close as I could get. So for even more flavorful cookies, you get slightly less calories and fat, fewer carbs, little less sugar and double the protien. Woot woot! Preheat oven to 375 Degrees F. Spray some cookie sheets, set aside. Combine the first 7 ingredients together until well mixed. Mix in the protein powder, dried oats and flour slowly. Lastly, stir in the chocolate chips. Scoop about 1 tbsp. sized dough per cookie onto the prepared baking sheets. Bake for about 8-10 minutes, or until the edges are BARELY brown. When you take them out, they’ll still look slightly undone, but that’s fine. Allow to cool just 2 minutes on the sheet, then remove to a cooling rack (carefully). 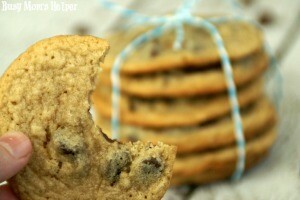 These cookies do AMAZING in the freezer! Make a big batch, toss some in a ziplock baggie into your freezer, then just pull them out whenever you need some cookies! My Dad likes to keep some on-hand in the freezer so he can grab a bag before a road trip. Fresh cookies during a long drive? Yes, please! You can, of course, adjust the ingredients to fit YOUR preferred tastes! Want to try another flavor protein powder? Then go for it! I’m curious what Strawberry flavored would end up like, with maybe some white chocolate chips? Yumm-o! I love Wednesdays, because they’re my designated ‘Disney Day’ where I share all sorts of Disney-themed tips, ideas, printables, you get the idea. Today I’ve got a really fun Free Printable Mickey Numbers & Letters sheet for you – great to use as a banner, cupcake toppers, a cut-out announcement, and so much more! There’s 1 sheet each – one for letters and the other for numbers. It’s designed to print onto an 8.5×11 sheet, but you can adjust it when printing if you want your pieces to be smaller in size. You can try enlarging them so you can have bigger letters or numbers, but I can’t guarantee the resolution quality (how blurry it may be). The numbers sheet has 1-9, and the letters one has the whole alphabet – plus a cute little Mickey Mouse dude on the side. These are some of our subscriber-exclusive free printables, so be sure to sign up below for our newsletter to get access to this and many other awesome printables! What would you use this fun Mickey banner printable for?